The April Free PS Plus Games are The Surge and Conan Exiles. Both games are heavily focused on killing you to teach a lesson. I’ve been enjoying The Surge, pretty much from the start. I like how it auto saves, which would have been nice if Bloodborne did that. I get the comparison that this is a futuristic Bloodborne, but I’m a tad better at The Surge than I am with Bloodborne. I’m sure that will balance out as it gets more difficult. So far, I’m still at the beginning and I’m having a hard time telling which body parts are armored and which parts are okay to attack. Then I came across a guy who was all armored and I realized that some fights are going to be harder than others. I did like how within the first hour, I got four trophies, that feels pretty rewarding. The game looks great and thus far, the mechanics have been working for me. It took a good 30 minutes or so before I finally got the hang of Conan Exiles. This was my first survival game and I don’t think I’m really a fan of the genre. Conan Exiles doesn’t really have a tutorial system, nor any hints at what to do next, besides instructing me that I’m hungry and thirsty. I did find a nice grassy area next to a river, there are creatures there as well as a tribe that doesn’t care for me. It took a while for me to figure out I could make twine myself using leaves. I thought I had to come across it. I keep dying like crazy due to the villagers or like the final time, I had finally made my bedroll, just outside of the grassy area, and a sandstorm came and killed me immediately. So I’ll give the game another night, now that I know how to cloth myself. The game would be more enjoyable if I died and I could find the spot I died at and pick up my resources again. The Surge lets me do that with dropped tech pieces but I can see why Conan Exiles doesn’t permit that. At least I get respawned near the grassy area now. I was just about to build walls but it takes a long time to gather all of the necessary stones. I’ll probably give each game one more night to play but I’m getting the itch to go back to Cosmic Star Heroine. The last time I played, I recruited new character, Lauren, who is a singer and a great one at that! Thanks to YouTuber TheHeroofLight for hosting the video! We lost Sue but I’m sure he’ll come back. I also added The Vanishing of Ethan Carter to my wishlist over at psprices.com as it sounds pretty interesting. I saw they offer a link to my wishlist for sharing purposes and I was like “who will use that?” but since they offer it and I have a pretty decent blog, I will share it. Thanks psprices! This week, the only discount I’m seeing is Kingdom Come : Deliverance is $40 down from $60. I still don’t understand the icons on the website below the games. What does a trophy, a target, and a number mean? I can’t seem to figure it out from searching the website either. Clicking the game title doesn’t state it either. In fact, those icons are nowhere to be seen on the game’s page. In anticipation to The Surge, I did redownload Bloodborne. Such a fun game and it finally clicked with me. I was enjoying myself, even with all of the times I died. I understood the point of the game is to be hard and that with each kill, we are becoming better Hunters. But it was so annoying losing all of that progress with each new sequence. It would be a little different if I was earning experience points with each kill, which we sort of do with the Blood Echos we earn from kills. But we can’t use those until we finally meet up with the Celtic Beast. Which, believe me, I looked up but from what I saw, we had to beat him first before we could level up. By this point, I had started save scumming and getting pass a spot, and then quitting the game, uploading my file and bouncing back to the game. Luckily, From Software, made the loading screens immediate and not even a minute later, I was back in the game. I felt lousy for doing that, especially with how often I did it, but I couldn’t redo some of those sections again as it was becoming tedious. On my way to the Celtic Beast, I did mess up and uploaded when I wanted to download, it was right after my initial death to the Celtic Beast and I thought all was lost. Instead, it turns out I earned Insight and was able to talk to the Doll in Hunter’s Dream and gained the ability to level up! So I went through most of the human fools and so many dogs and went from Level 10 to Level 13, I upgraded my axe after speaking to Gehrman. I also made sure I had 10 Molotov cocktails as I noticed Celtic Beast was weak to them. Only five of them seemed to hurt him but it was enough of an advantage that I was able to finally kill him on my sixth attempt. There was a lot of dodging but I finally earned my first trophy in Bloodborne! Which was my main goal with this run, was to earn at least one trophy and then move back to my other active games. 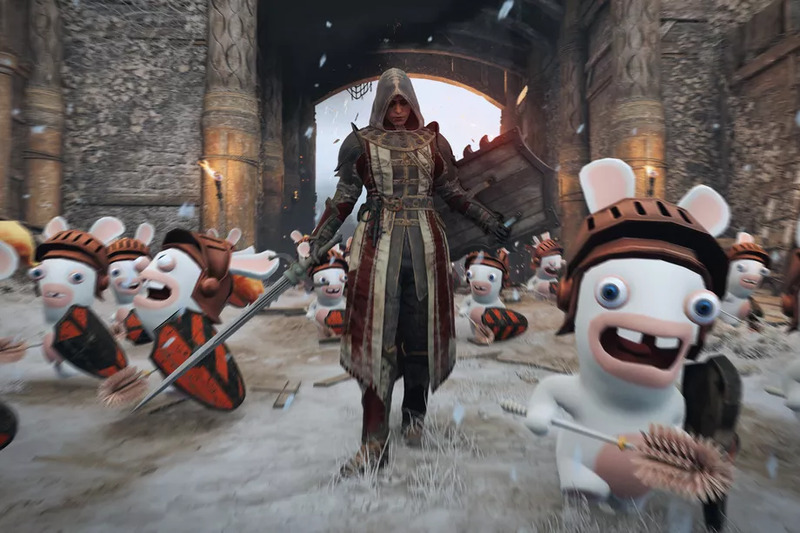 Before I could get back to the backlog, for April Fools’ Day, Ubisoft allowed Rabbids to invade For Honor! and committed to myself to try to get some of the easier trophies, which now I have eight trophies and that feels pretty good. I was doing Player vs AI Dominion battles, enough times to get my Lawbringer Knight to level 8 and being frustrated I couldn’t get the Principled Warrior trophy to pop. Then rereading the guide, I had to play on Player vs. Player Dominion, which I was trying to avoid but I did earn that trophy. Such a fun game and I might try to earn Reputation 1 with my Lawbringer but I’ll put that plan on hold for the time being. But that gimmick totally got me to come back to the game and I was having a blast. 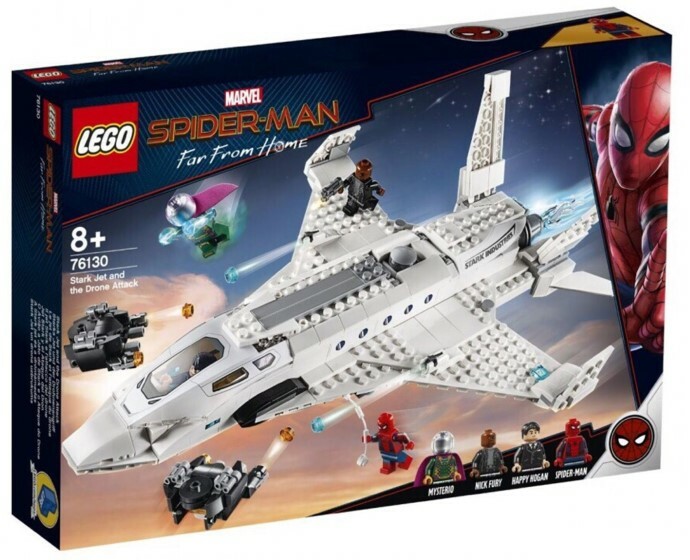 There are a series of YouTube videos of lucky folks who got the Lego Avengers Endgame and Lego Spider-Man Far From Home sets early. 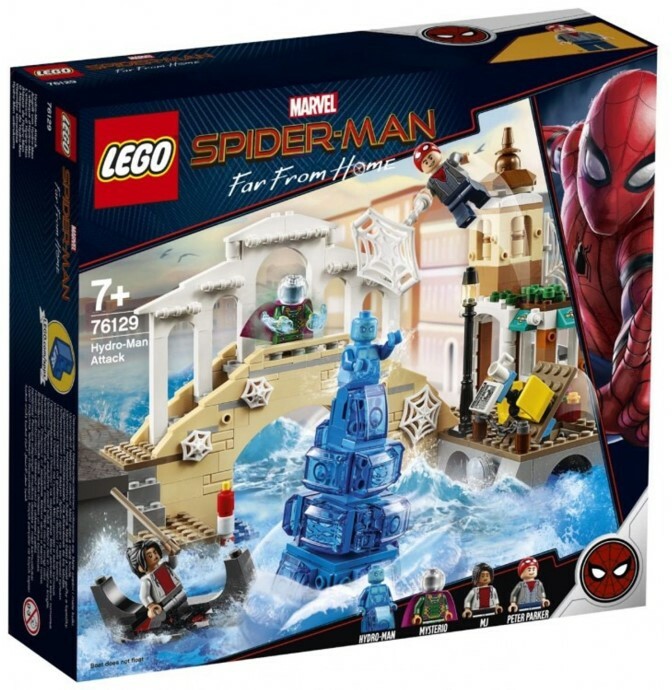 Walker Dennis really wants the Hydro Man set as it comes with a Peter Parker that has a hair piece as well as a Spider-Man beanie, which looks super fun. This set is $40 and there is a Moltan Man set for $30 (that I could be convinced to pick up for him) and a jet set for $70. 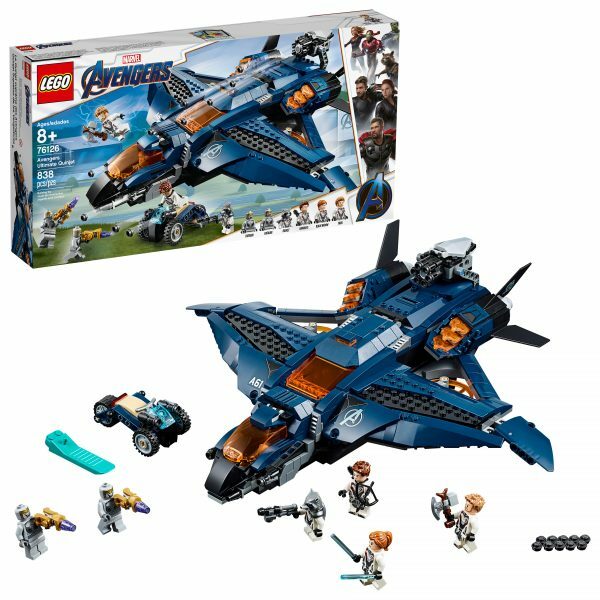 Lego must have jet pieces to spare as Captain Marvel has a set that involves a jet as does Avengers Endgame, and they are all in the $70 range, so the jets must be pretty big but we don’t need a jet so we will probably pass on those. At least they are all different types of jets. 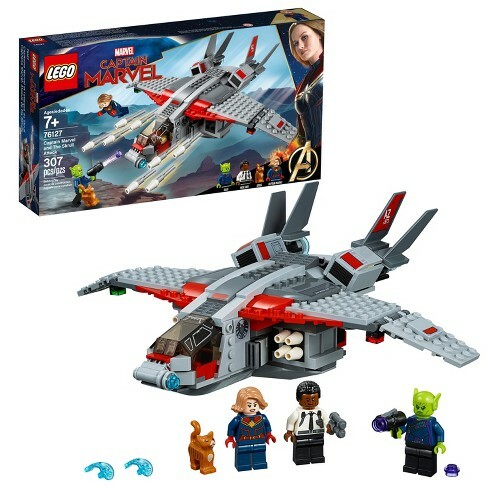 I do like how Captain Marvel got only one set, as a potential Lego collector, I like the idea of buying one and being done with it. Spider-Man Far From Home only having three is also ideal. Avengers Endgame having five makes sense as it is the bigger movie, has more characters, and more set pieces. I also like how Captain Marvel’s is only $30 too, so that’s nice on my wallet. 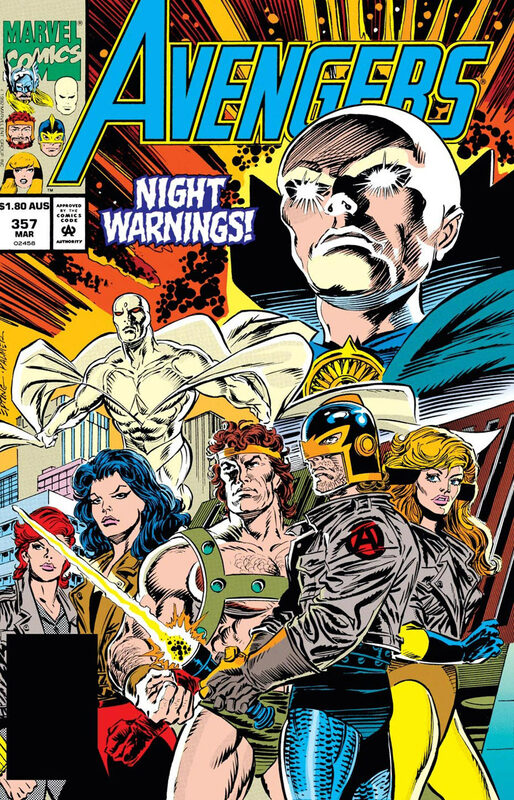 I do like how the Avengers’ sets have them all in a team uniform, something the Avengers haven’t had since the late 90s when everyone had jackets. 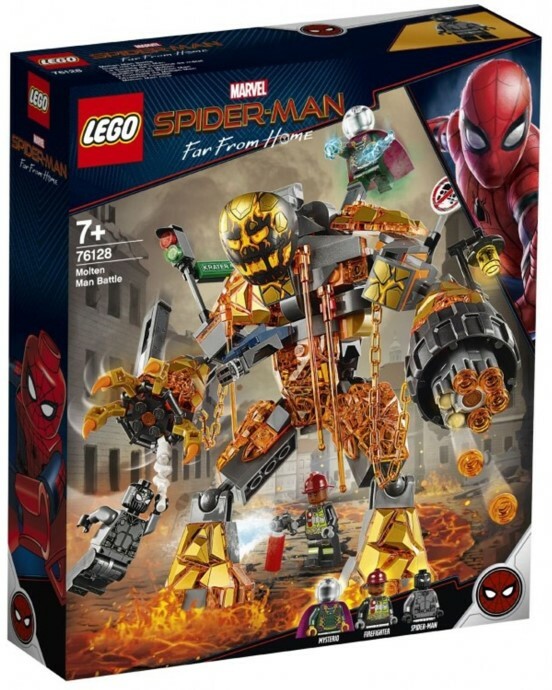 I also like how Mysterio is in all three of the Spider-Man sets, as I would hate to buy one and not get the main villain from the film. Though having two of them will be a tad irritating but at least one can be a decoy one or a robot, or possibly a decoy robot. Now that we have four Spider-Mans and five Emmets, I don’t care about doubling up on characters anymore, I lost that battle. I might as well post the image of the third Spider-Man set as I’ve referred to it enough and posted the other two. He’s a bit of a spoiler but the set looks amazing! 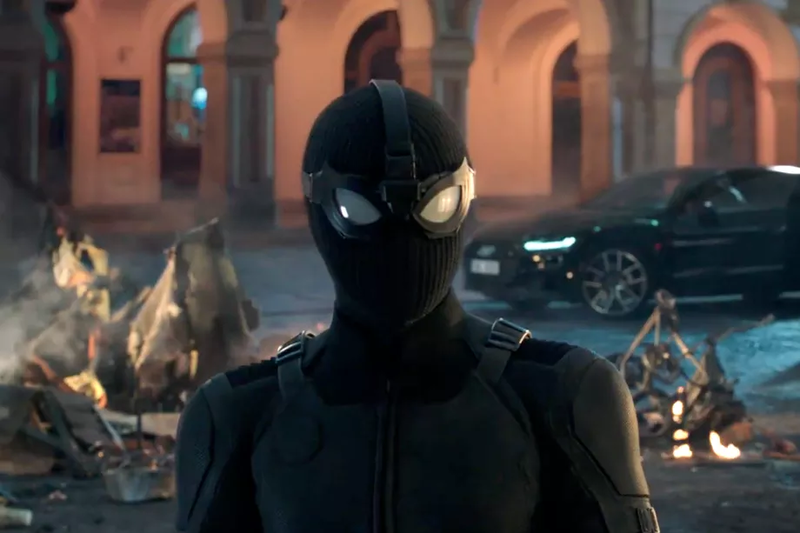 Plus that gray Spider-Man suit that is hinted at in the trailer. I really wished instead of a generic fireman, it was a legit character from the movie. But we also don’t have a Lego Fireman so that’ll be nice to get one. I’m really hoping we can see Captain Marvel prior to Endgame but I’m not even sure we’ll be able to watch Endgame either. Which is a real bummer but we’ll definitely be watching Spider-Man in the theater. There is just so many movies coming out!